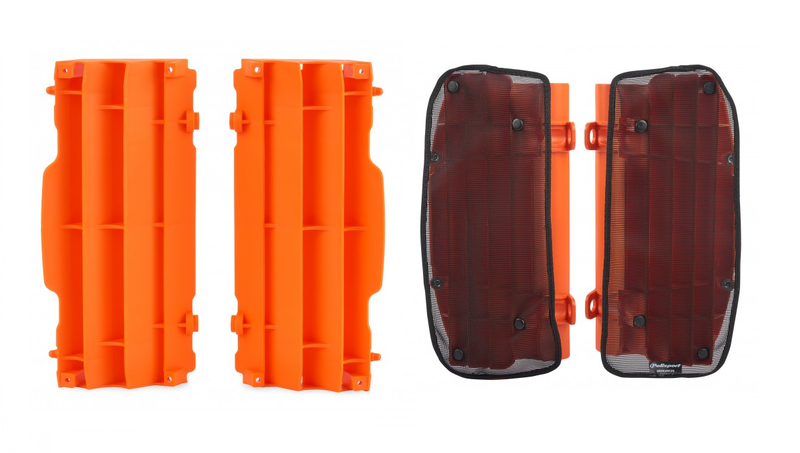 Polisport Radiator Louvres are now available in addition to Polisports ample range of plastic replica parts which cover every top brand in the off-road market. The radiator is an essential, and one of the most fragile parts of your bike, so it’s crucial to protect it with the plastic louvres (louvers/vents). Resistant and Durable Polypropylene construction. Provides the perfect airflow to the radiator. Easy installation & perfect fit to replace orignal manufacturer louvres. Now, Polisport also offers special mesh for the radiator louvers, which will add increased protection for ridding in muddy or sandy terrains. Polisport’s mesh were developed exclusively for Polisport’s radiator louvers, with a design that will fit them perfectly. The mesh is easily clipped on and off the louvers without need to disassemble the radiator scoops.